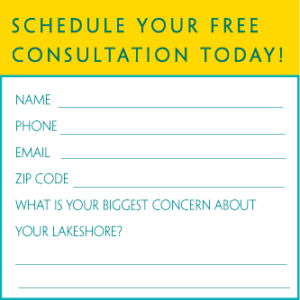 Fill out this form and a trusted Waterfront Restoration expert will contact you (within one business day) to answer your questions and advise you on the best solutions available in order to help you make the best decision for your lakeshore. This phone call usually only takes ten minutes or less, and it’s free. We are new to Waterfront Restoration’s service and have nothing but good things to say regarding the employees, efficiency, and service. The divers have gone above and beyond the expectations of service, could not be more polite, and have done an excellent job. At Waterfront Restoration, we’re about providing top-quality service to clients who love the lake as much as we do. We realize that investing in a long-term, chemical-free lakefront maintenance solution is a big decision, so we strive to be as up-front as possible with our pricing. Here’s what you can expect. The square footage of the proposed area for lake weed removal, as well as water depth, sediment type, weed lines, zebra mussels, algae accumulation, and decomposing leaves or weeds. The density and species of the weeds in the area, other objects that need to be removed, shoreline cleanup options, dock and boatlift cleaning, sand beaches, raking, and other requests or tasks that might be involved. Your specific needs and expectations. We go above and beyond in our service of each client, but success looks different for everyone! We’ll talk about how you use your piece of the lake, how often you’d like us to visit, and how we can best support your lifestyle. You’ll get to know our team of professional, experienced, local technicians. Waterfront Restoration was the first business of its kind in the area—and it’s still the best today. Just as our clients! The most specialized by-the-root, chemical-free cleaning process in the industry, boasting immediate results removing 95% of weeds’ roots, stalks, and biomass. There’s no danger and no down-time. Minutes after we leave, you can jump in the water, worry-free. Our teams are fully insured, background-checked, and DNR Level 1 and 2 trained. In other words, you don’t have to worry about a thing! Our trustworthy teams adhere to industry best practices and care about the lake’s health as much as you do. A supportive and well-equipped customer service team is available year-round to answer your questions and troubleshoot any issues that might come up. We use the safest and most efficient equipment, from SCUBA tanks to safety equipment to clean-up tools. Our teams will have the right tools to get the job done safely and efficiently. We’re a one-stop-shop for lakefront care. We’ll help you think big-picture about the long-term health and beauty of your shoreline. If there are services or products that we agree might be a benefit, we’ll help line them up for you! We take pride in being the most thorough and forward-thinking professionals you can have on your side. No hassles or headaches--just friendly, trustworthy lakeshore cleaning that you can always count on. Backed by a 7-day, 100% satisfaction guarantee. During your free consultation, we’ll plan the cleanup times around the most effective schedule. If you’d like, we’ll even let you know when we’re on our way! Once the experienced dive team arrives, they’ll review your instructions and suit up in SCUBA gear. They’ll pull the invasive weeds from your lake area, getting to the root of the problem for longer-lasting beach enjoyment. We won’t stop there…we’ll remove any dangerous objects or debris we find underwater. Missing something? We’ll find and return valuables, too. We’ll pay close attention to hard surfaces and irrigation intakes, observing areas for zebra mussels and other invasive species and let you know what we discover. The shallows will get special attention when we rake the lake bottom near shore and collect loose weeds. We’ll remove garbage and organic material, thoroughly clean your dock, and make sure the whole property looks great. We’ll take notes of anything out-of-the-ordinary so the next visit is as efficient as possible. You’ll get a follow-up notice so you know we’ve been there. There’s a 7-day Love-Your-Lakefront Guarantee. If something’s not quite right, we’ll fix it immediately! We’ll help you think big-picture about the long-term health and beauty of your shoreline. If there are services or products that we agree might be a benefit, we’ll help line them up for you! We take pride in being the most thorough and forward-thinking professionals you can have on your side. Request your free consultation and cost estimate today! We absolutely love the improvement of our swimming area. Our grandchildren are not afraid to swim because the weeds are not tickling their legs. As we motor around our neighboring shorelines our swimming area and lakefront area by far is the best! I was very pleased how fast they were able to come to our house. The divers were very knowledgeable of what needed to be done to fit our needs. Great job. I am very pleased how clean that Waterfront has kept our swimming area and shoreline. They are timely and expeditious in their cleanup efforts. We use the lake much more than we would without their services.